The DevOps Dudes: CredSSP...say what? I'm working on a DSC configuration for SQL Server Reporting Services and it is quite a simple configuration with very few required resources. However, one of the resources (xSQLServerRSConfig) does something rather odd in it's Set-TargetResource function - it uses Invoke-Command to loop back to the same server and specifies the -Authentication parameter as CredSSP. 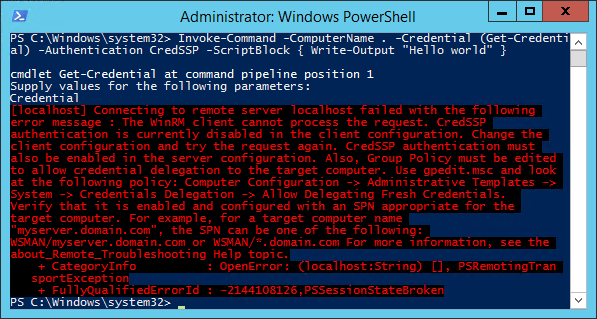 After spending ages trying to learn what the CredSSP protocol is and why someone would use it (see https://4sysops.com/archives/using-credssp-for-second-hop-powershell-remoting/ and https://technet.microsoft.com/en-us/library/hh849872.aspx ) I decided to check for a DSC resource to enable it...and there is one, xCredSSP. Happy days! Seems simple enough, and it just works (the resource that is) but the resource that needed it still failed with the same error. I tried setting my node as the client and then as the server and then as both (by specifying both configurations above) and still nada, nothing, zip - the exception was the same. Well, that did it. By telling the security provider that implements CredSSP what servers were allowed to be delegated to, it just worked. It is worth noting that the DelegateComputers property supports an array of computer names or even the *.mydomain.com wildcard.